Victor Korchoi, in his 80s In March 1982, I received a handwritten letter (written in February 1982) by Viktor Korchnoi via Natasha Peysikova of Brooklyn, who, at the time, was the fianc�e of Korchnoi's son, Igor. 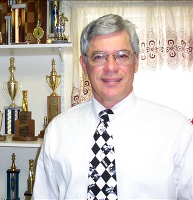 At the time, I was editor of the Dayton Chess Club Review, and co-editor of the Ohio Chess Bulletin. The letter was intended to be published in the United States on behalf of his family. Other journalists probably got the same letter. Since 5 and a half years ago I have left the USSR, I am fighting for a reunion with my family, for liberation of my wife and my son from the Soviet country. I have applied to various political figures of the world, to a number of organizers — "Amnesty International" and others, several times. I have tried to draw an attention of FIDE to my family's case. When before the match in Merano, 1981, with Karpov, Mr. F. Olafsson officially applied to Soviet authorities with a request to release my family, it seemed — Soviets faltered. Their officials assured Mr. Olafsson, that the family soon would be freed. First reports on my family situation appeared in the Soviet media. But the match has been over already, whereas my family is still in the USSR. Soviets now promise to let my family go, as soon as my son finishes to serve his residence in a Siberian camp, accused for allegedly an evasion of a draft into the Soviet army. His term — 2 � years — will come to an end on the 13th of May . The only possibility to compel Soviets to keep their promise — is to remind them by the thousands, dozens thousands letters! I appeal to U.S. chessplayers with a request to help me — for sake of humanity and justice, for sake of maintenance of human rights in the world — to unite at last with my family. Your letters to senators. To F. Olaffson, or, directly, Moscow, Kremlin — to Breshnev or Andropov, will be a considerable suppprt to me in my struggle for life and liberty of my wife and son! Viktor Lvovich Korchnoi was born in Leningrad on March 23, 1931. In January 1976, while taking part in the Hastings annual Christmas chess tournament, Korchnoi was making plans for a flight to the West. In July 1976, Korchnoi (ranked No. 2 in the world), age 45, tied for 1st place at the IBM International in Amsterdam, along with Tony Miles (1955-2001). At the end of the tournament on July 27, Korchnoi defected and asked for Dutch political asylum (he had to ask Tony Miles how to say and spell "political asylum"). Instead of flying to Frankfurt en route to the USSR after the tournament, he went to the Amsterdam police headquarters and asked for asylum. All he had with his was his chess library. As a result, Korchnoi became the first strong Soviet GM to defect from the Soviet Union. Korchnoi feared he would not be allowed out of the USSR again because of his criticisms of world champion Anatoly Karpov. He left his wife, Isabella (Bella or Bela) Markarayan Korchnoi (married in March 1958), and 17-year-old son, Igor, behind. Korchnoi was declared 'persona non grata' by the Communist regime. The first person to congratulate Korchnoi on his defection was Bobby Fischer, who had sent him a telegram that read, "Congratulations on this good move!" Later, Fischer accused him of being a Soviet agent. In the Netherlands, Korchnoi was refused asylum on political grounds, but he was granted the right of domicile on humanitarian grounds. In 1977, Korchnoi was formally declared Enemy of the State in the USSR. In 1977, Korchnoi won the National Chess Championship of the Netherlands. In 1978, he settled in Switzerland (after some time in the Netherlands and West Germany) and became a Swiss citizen. In 1978, Igor Korchnoi was compelled to leave college on filing a petition to leave the USSR to join his father. Having left the institution of learning, Igor lost the right to draft deferment. In January 1979, Korchnoi was stripped of his Soviet citizenship along with his title and decorations, and efforts were made to blacklist him internationally. In March 1979, I met and interviewed Viktor Korchnoi in Charlotte, NC when I was president of the North Carolina Chess Association and contribute to the state chess magazine. He put on a 50-board simultaneous exhibition while in Charlotte. At the time, he told me he was thinking of settling in the United States but wanted to get his family out of the Soviet Union first. On December 19, 1979, the trial of Igor Korchnoi, charged with evading the draft, took place at the Vasileostrovsky Raion Court in Leningrad. The court charged Igor with draft dodging and sentenced him to 2 and � years in a labor camp. On March 3, 1980, five days before the start of the Korchnoi-Petrosian quarterfinal world championship match in Velden, Austria, Viktor's son, Igor was sent to a Siberian gulag in Kurgan (1,000 miles east of Moscow) as a "particularly dangerous criminal," according to a court decision. The Soviets were applying personal pressure on Korchnoi to lose the match with Petrosian. Nevertheless, Korchnoi beat Petrosian, scoring 5.5 to 3.5. Korchnoi later said, "While I was winning in Velden, the KGB won its match against my family." In 1981, Korchnoi met Anatoly Karpov (1951- ) in Merano (Meran), Italy for the world chess championship match. Korchnoi's wife and son were still in the Soviet Union. Natasha Peysikova, the fianc�e of Viktor's son, Igor, was in the audience. She and her mother successfully emigrated from the Soviet Union in August 1980, and moved to Brooklyn. She was in Merano, telling reporters, "I thought it would be an inspiration to Viktor to have somebody close to Igor remind him that this son is still in prison." Viktor's son had been promised release to join his father in exile if he gave up his passport. When he did, he was promptly drafted in the Soviet army, which he refused to serve. Accepting the draft would have complicated his leaving the Soviet Union. Igor feared that the he would come in contact with military secrets, which meant an automatic denial of permission to emigrate for at least 10 years. He was then arrested for evading army service, sentenced to two and a half years in a labor camp in Siberia, and served his full sentence. Korchnoi wrote letters to President Leonid Brezhnev, former President Carter, Pope John Paul II, Jean-Paul Sartre, and Senator Edward Kennedy asking for help in getting them free. In May 1982, Igor Korchnoi, age 23, was released from a Siberian prison camp in the Kurgan area and returned to Leningrad. His mother, Bella, met him at the camp and they both returned to Leningrad where they applied to emigrate. Viktor called his wife from Switzerland and hoped that his family would be able to leave the Soviet Union shortly. 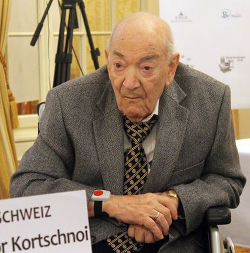 Several times the Swiss government asked the Soviets to allow the Korchnoi family to emigrate. The family was turned down for repeated requests for exit visas. In June 1982, Bella and Igor were granted visas to leave the Soviet Union. On July 3, 1982, Bella and Igor, along with Korchnoi's stepmother, Rosa Friedman, finally left the Soviet Union, when they arrived in Vienna. They arrived at 10:20 am in Vienna aboard an Aeroflot flight from Leningrad. They then took a Swissair flight to Zurich, Switzerland. According to newspaper reports, Viktor was unable to greet his wife, son, and stepmother at the Zurich airport because of a contract to play in a chess tournament in Colmar, France, about 90 miles away from Zurich. He met them later in the day. Korchnoi said he had originally been told that his family would leave Leningrad on June 27, 1982, and therefore he signed a contract to play on Sunday, July 4, the same time that his family arrived in Zurich. Igor was wearing a 'Divided Families of the World' button, and said he hoped to study engineering or mechanics in the United States. Korchnoi returned from France for a quiet family reunion at his lawyer's home in the town of Glarius, near Zurich. On November 10, 1982, Leonid Brezhnev (1906-1982) died. Viktor divorced Bella in 1983. Igor later moved to Switzerland, where he became a software designer. He had been an electronics student earlier. In August 1990, Soviet leader Mikhail Gorbachev (1931- ) restored the citizenship of Korchnoi. Korchnoi said it wasn't enough to make him return to the Soviet Union. In the 1990s, Bella Korchnoi died. In 1991, Korchnoi married Petra (Hajny) Leeuwerik. They had first met in October 1977. She had spent 10 years in the Russian Gulags, from 1945 to 1955, after being arrested in Leipzig on suspicion of being a spy. She was released only after Stalin's death. On August 26, 1991, Korchnoi was finally given Swiss citizenship. On December 26, 1991, the Soviet Union's parliament formally voted the country out of existence. Korchnoi died at the age of 85 on June 6, 2016, in the Swiss city of Wohlen.